An international collaboration of scientists, led by the University of Leicester, has investigated Earth's climate over half a billion years ago by combining climate models and chemical analyses of fossil shells about 1mm long. This interval in time is known for the 'Cambrian explosion', the time during which representatives of most of the major animal groups first appear in the fossil record. These include the first animals to produce shells, and it is these shelly fossils that the scientists used. Scientists have long thought that the early Cambrian Period was probably a greenhouse interval in Earth's climate history, a time when there were no permanent polar ice sheets. Until now, however, scientists have only had a sense of what the Cambrian climate was like because of the types of rock that were deposited at this time - while it has long been believed that the climate was warm, specific details have largely remained a mystery. Thomas Hearing, a PhD student from the University of Leicester's School of Geography, Geology and the Environment, explained: "Because scientists cannot directly measure sea temperatures from half a billion years ago, they have to use proxy data - these are measurable quantities that respond in a predictable way to changing climate variables like temperature. In this study, we used oxygen isotope ratios, which is a commonly used palaeothermometer. 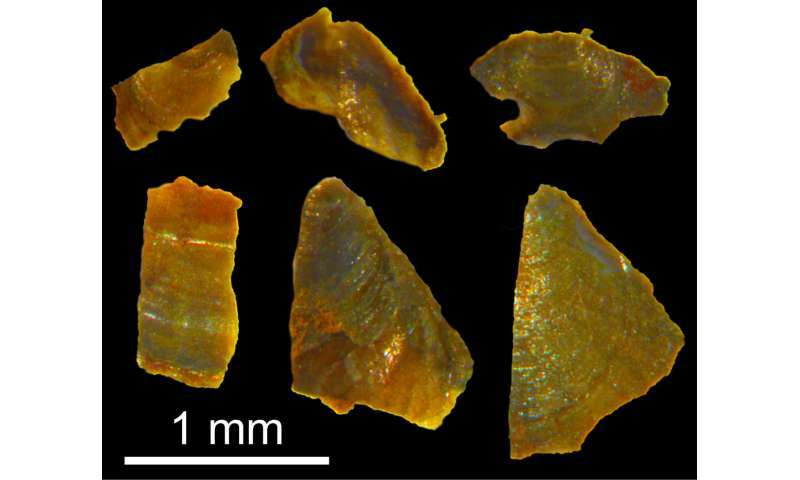 "We then used acid to extract fossils about 1mm long from blocks of limestone from Shropshire, UK, dated to between 515 - 510 million years old. Careful examination of these tiny fossils revealed that some of them have exceptionally well-preserved shell chemistry which has not changed since they grew on the Cambrian sea floor." Dr Tom Harvey, from the School of Geography, Geology and the Environment, added: "Many marine animals incorporate chemical traces of seawater into their shells as they grow. That chemical signature is often lost over geological time, so it's remarkable that we can identify it in such ancient fossils." Analyses of the oxygen isotopes of these fossils suggested very warm temperatures for high latitude seas (~65 °S), probably between 20 °C to 25 °C. To see if these were feasible sea temperatures, the scientists then ran climate model simulations for the early Cambrian. The climate model simulations also suggest that Earth's climate was in a 'typical' greenhouse state, with temperatures similar to more recent, and better understood, greenhouse intervals in Earth's climate history, like the late Mesozoic and early Cenozoic eras. Ultimately, these findings help to expand our knowledge of the early animals of the period and the environment in which they lived. Thomas Hearing said: "We hope that this approach can be used by other researchers to build up a clearer picture of ancient climates where conventional climate proxy data are not available." The research was carried out as an international collaboration involving scientists from the University of Leicester (UK), British Geological Survey (BGS; UK), and CEREGE (France). This collaboration brought together expertise in geochemistry, palaeontology and climate modelling to tackle this longstanding problem. The scientists have co-authored an open access (publicly available) paper in the journal Science Advances. Warm climate gooood...cold climate baaaad.